You are here: Home / Network and Application Security / What is a cloud generation firewall? 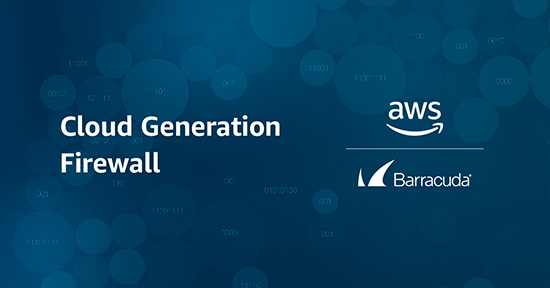 We hope you've seen our announcement introducing Barracuda Cloud Generation Firewall capabilities. We're excited to be adding this new functionality to our Barracuda Web Application Firewall (WAF) and Barracuda NextGen Firewall (NGF). In this blog post I'd like to take you through what this means and how it can help you. Let's start with some background on cloud adoption. Multiple Barracuda surveys have revealed that although companies are migrating to the cloud, there is still concern and confusion over public cloud security. Developers are also concerned about the security of the applications they are building in the cloud, and many organizations are simply unsure of how to deploy their existing security strategies to a cloud or hybrid environment. Budget considerations also require usage and licensing planning, and this can be a daunting task for people who are new to concepts like meshed connectivity and metered billing. Barracuda Cloud Generation Firewalls are engineered to help customers overcome these challenges and fully embrace the potential of the public cloud. What does Cloud Generation mean? Firewalls have been designed to protect data centers or central offices, and distributed networks with multiple locations are dependent upon other pieces of the network in some way. This often leads to lower scalability options and higher costs. One of the benefits for companies moving to the public cloud is that they can embrace a loosely coupled architecture, where there is no backhauling or other interdependence on dispersed locations. These companies can then leverage metered billing, automated deployments, horizontal (elastic) scaling, and other features that are native to the fabric of the public cloud. But to do that, they need cloud generation firewalls that support these functions. Barracuda Cloud Generation Firewalls provide all this functionality and more. There are so many benefits here that it's hard to pick just a few. Probably the most obvious benefit of Barracuda cloud generation firewalls is that they are best in class security solutions for networks and applications, regardless of the deployment model. These solutions can protect your entire infrastructure, whether it is based at your premises, in the public cloud, or distributed across both. There's no need for any gaps in your security, whether you are migrating a workflow or moving your data storage or spinning up new servers for app development. Barracuda Cloud Generation Firewalls cover it all. Another clear benefit is that these firewalls support the new consumption models of the public cloud. Because cloud applications must meet variable workload demands, it can be difficult to predict resource usage accurately. IT is expected to meet performance requirements at peak activity, regardless of usage levels at other times. In an on-premises infrastructure, this usually means sizing and licensing for the highest demands and absorbing the costs of unused licensing and capacity during non-peak times. Because the public cloud is designed to support fluctuating workloads, customers can take advantage of metered billing. This is a usage-based billing that responds to workload scaling. In short, customers can match the cost of infrastructure to the cost of consumption. Performance levels are met as expected, quality of service levels are maintained, and there are no wasted licensing costs. When you're ready to test drive the Barracuda Cloud Generation Firewall, visit us at booth #1533 during AWS re:Invent, or visit our corporate site here. Toss your enterprise firewall. Get the right tool for the job: a cloud generation firewall for AWS with true utility-based licensing. Learn more now!